The exhibition was split as usual at the V&A into two areas. 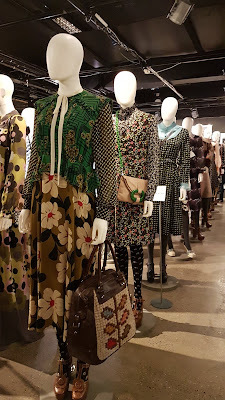 The more informative exhibits focusing on the history of the fashion industry were downstairs and the displays of dresses and clothing were upstairs. 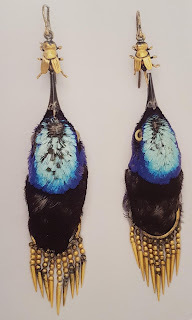 Naturally I wanted to make a bee-line for the dresses upstairs, however, I followed the history of using animal fur to make felt hats, whalebone to make corsets and small brightly coloured birds to make earrings or to adorn hats feeling more and more contempt for the industry. But killing animals directly for fashion is only the start of the problem. 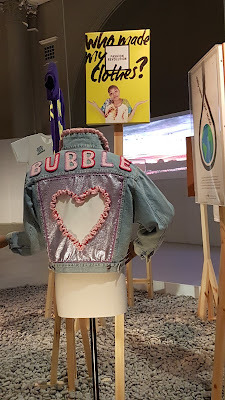 We think we stop being cruel to animals if we use natural fabrics such as cotton, or artificial fabrics such as rayon; however it was interesting to learn just how much water is required to create both types of fabric. Water courses have been redirected in order to sustain the need to feed factories, which means lakes and rivers drying up and changing the ecology of an area and therefore the death of indigenous species. It’s not only the amount of water that is required, but the volume of chemicals which are needed to obtain the fibres from the plants. The noxious chemicals reach the watercourses and cause health issues for both man and beast, and with our desire for throw away fashion, the fashion industry has become the second most polluting industry in the world. The exhibition starts circa 1600. During the 17th & 18th centuries, exploration of the globe led to the sourcing of new raw materials for the fashion industry. 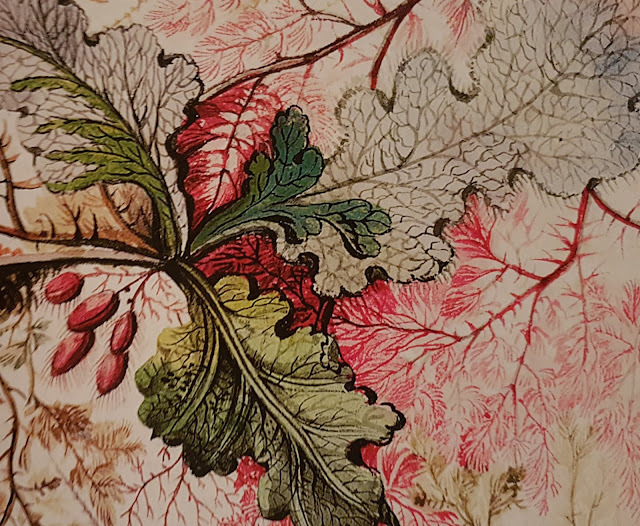 New flora and fauna was discovered; botanical prints could be used as patterns, or creatures and their pelts used as fabrics. In the 19th century, new transport, the opening of museums and access to cheaper publications allowed fashion to extend to the working classes. The production of cotton became Britain's most important textile industry. Large mills were created in the industrial north of the country which adopted new mechanised approaches to spinning and weaving, allowing cloth to be created on a faster and greater scale. Railways allowed for the transportation of material in an easier and quicker manner than the old canal networks. 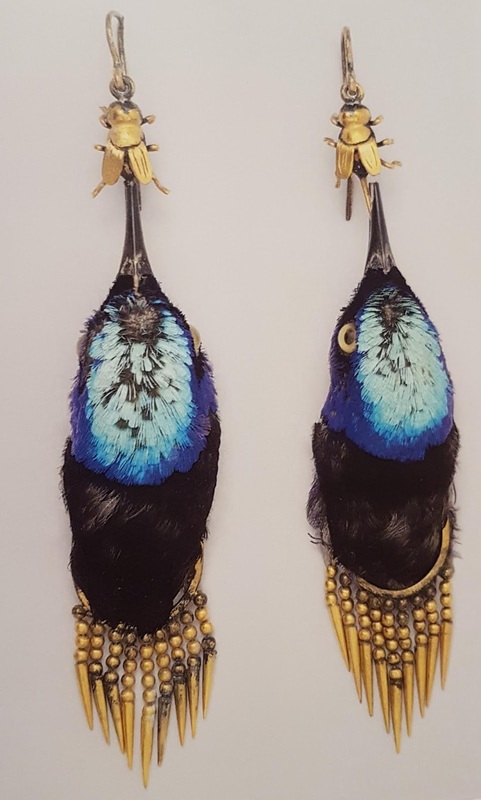 New technology allowed for the creation of chemical dyes, however, it was still impossible to recreate the iridescence of colours found on certain birds and shells which were popular with the masses. 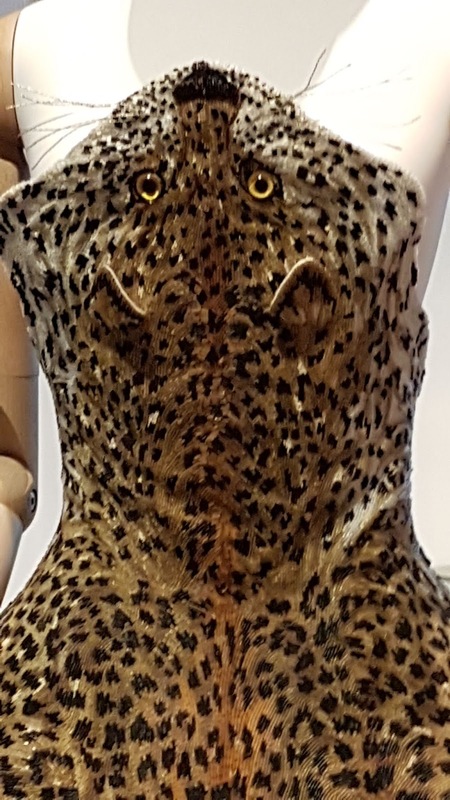 This desire to follow fashion led to the endangerment of many ecosystems and the possible extinction of some wildlife. During the twentieth century many further advances have been made in technology. It is quicker and cheaper to manufacture clothing. 24 hour news showcases the latest fashion trends, and for those who can't afford designer goods, they can buy cheap imitations imported from China on the high street. But at what cost? Faux fur items that those concerned with animal rights might buy have been found to contain real fur. High Street retailers have used suppliers who have mislabelled items, and they have been guilty of selling real fur from who knows where. Which leads me to wonder what it really is that I'm buying when I go into a store. Can I really trust what is written on the label? As we enter present day, technology allows us to use our knowledge more wisely. 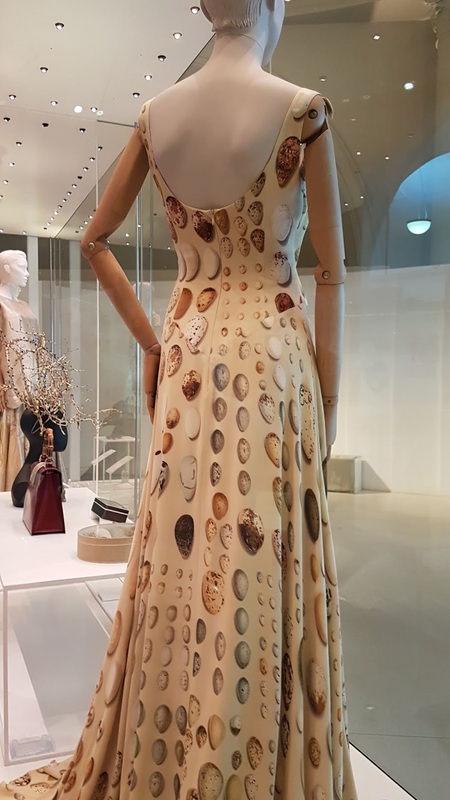 Designers such as Stella McCartney highlight the darker side of the fashion industry, and she's making it trendy to care about what we wear. 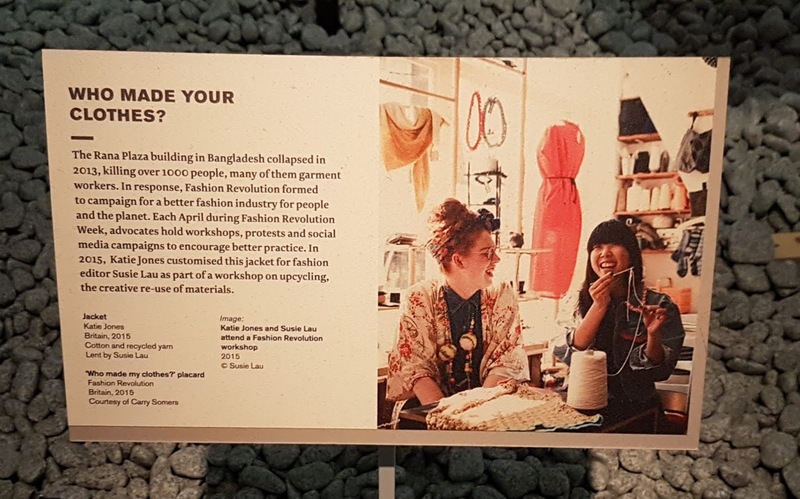 The culture of consumption can be changed, a common threads initiative of Reduce, Repair, Reuse and Recycle was advertised for Patagonia in 2011, encouraging shoppers to think about the environmental impact of buying new clothes. It is a brave and inspiring exhibition that the V&A has chosen to put on. It has given me food for thought about how wasteful the industry is and whilst I've never been a follower of fashion, as can be seen by the contents of my own wardrobe, it has made me think about making more classic items for myself, and recycling some of those old things that no longer fit before I think of throwing them away! 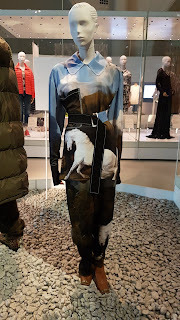 The V&A exhibit took me longer to get round than I expected, so I had to forgo my elevenses in their gorgeous cafe and hop on the tube to London Bridge instead so I could visit the Fashion and Textile Museum (created by Zandra Rhodes). Every trip I’ve made to London I’ve promised myself I would seek the museum out. The opportunity has never arisen though, but here, with time to myself, I could go and find out what it is all about. It’s a lovely small space which doesn’t house any permanent exhibits. Instead it exhibits one collection for several months before clearing it out and putting something new on display. 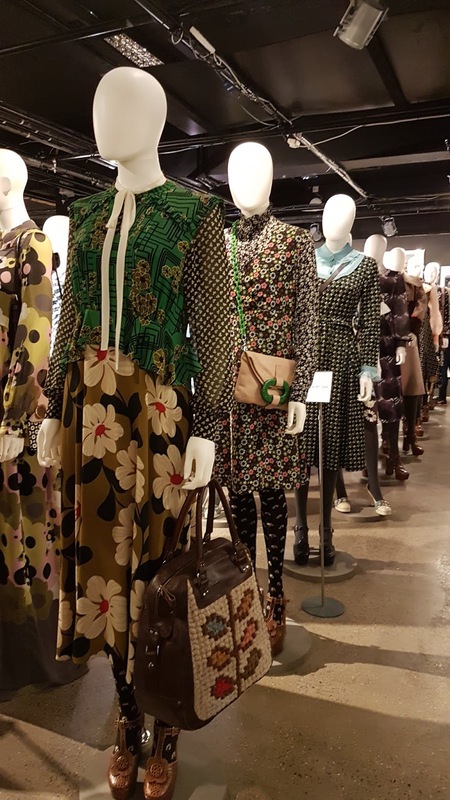 On this occasion, the Irish designer Orla Kiely was the focus. 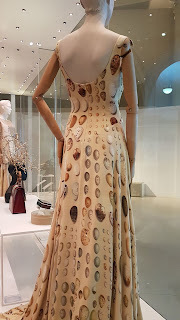 I like her designs so I was thrilled that I had got up early and was able to view both it and the V&A display. Orla Keily is an Irish designer, well renowned for her retro patterns. Inspired by the upbeat design of the 60's and 70's, Orla's designs can be recognised on coasters and oven mitts, handbags and smock dresses. The designs look simple enough, regimented patterns repeated like soldiers on the parade ground, but it is this seeming simplicity that made her globally successful with her signature style. The patterns are not trendy and up to the minute, they hark at times past, so they have the potential to always be on-trend. But success sometimes comes at a price. What started out as a business making felted hats, expanded to handbag design, because whilst not all women wear hats, all women carry bags. The success of her "Stem" pattern allowed further expansion into the world of homeware, wallpaper, bedding, candles, shoes, ready-to-wear fashion...the list went on. 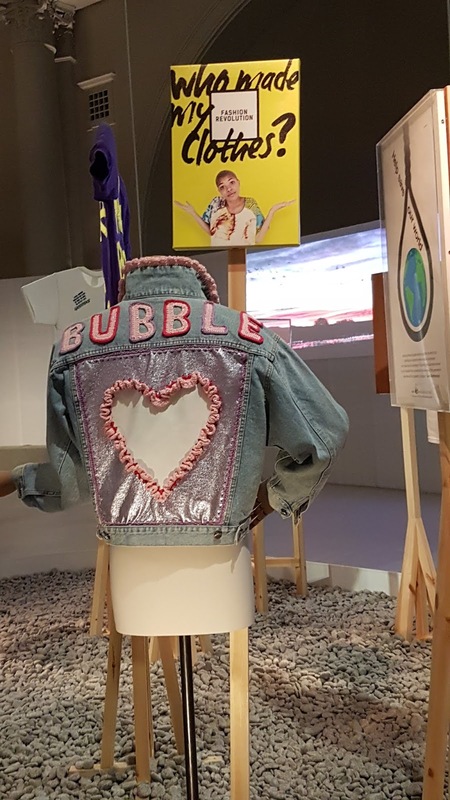 But whilst this exhibit was showcasing the designers hard work and success, behind the scenes her company was making losses leading to the company heading into administration. The news was confirmed on the 17th September 2018 that her fashion business had ceased trading. Sometimes less is more...you don't want to be wearing an expensive dress in the same pattern as the duvet cover on your bed; or worse, to turn up to a house party and find you're wearing the same design as tea towel someone's mopping up spilt wine with! It was a fabulous exhibition, now tinged with a little sadness, but one that reminds me that "better a little which is done well, than a great deal imperfectly." (Plato) Perhaps if she had designed with specific products in mind than a one size fits all approach, consumers may not have fallen a little out of love with her.